Public Drainage Systems: A 16.5-foot minimum width continuous buffer of perennially rooted vegetation on public "County" drainage ditches. What's the timeline for landowners to come into compliance with the new buffer law? November 1, 2018: Buffers in place on all public drainage systems. 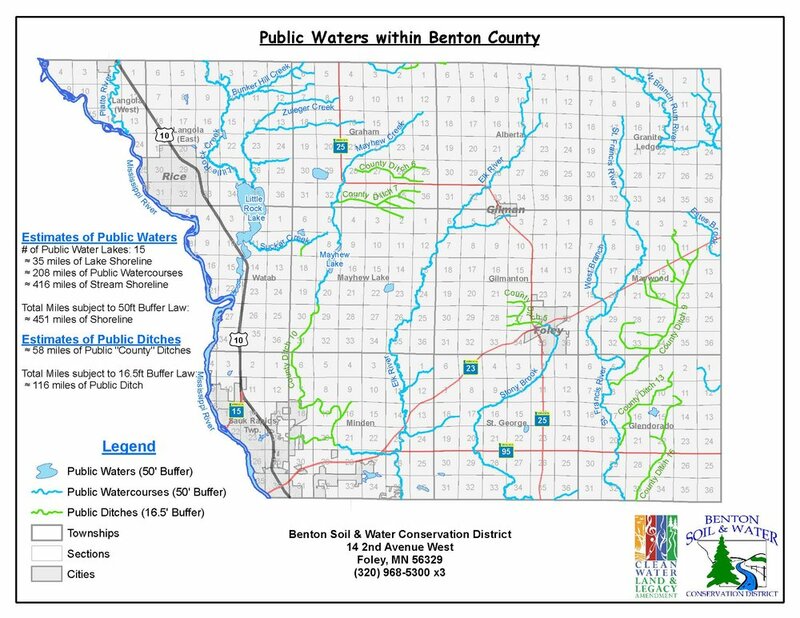 Benton Soil & Water Conservation District (SWCD) aims to assist landowners in determining compliance status and moving towards the direction of 100% voluntary compliance with the new buffer law and existing State Rule and County Shoreland Ordinance. The Benton SWCD will provide technical and financial assistance options to landowners for the design and implementation of required buffers. If you want a printable map (shown below) please click here. Buffer Strips are planted strategically between fields and surface waters (rivers, streams, lakes, and drainage ditches). They provide a wide variety of environmental benefits ranging from protecting water quality, soil conservation, to wildlife habitat. Buffers can be especially helpful to you in maintaining a productive, profitable, and responsible farming or ranching operation. Today, America's farms and ranchers do more than produce crops and livestock. They play an important role in maintaining the environmental quality and improving fish and wildlife habitat...while demonstrating their commitment to land stewardship. Conservation Programs offer financial and technical assistance to compensate landowners for taking sensitive agricultural land out of production. Contact your local SWCD/NRCS office to learn more about eligible programs. 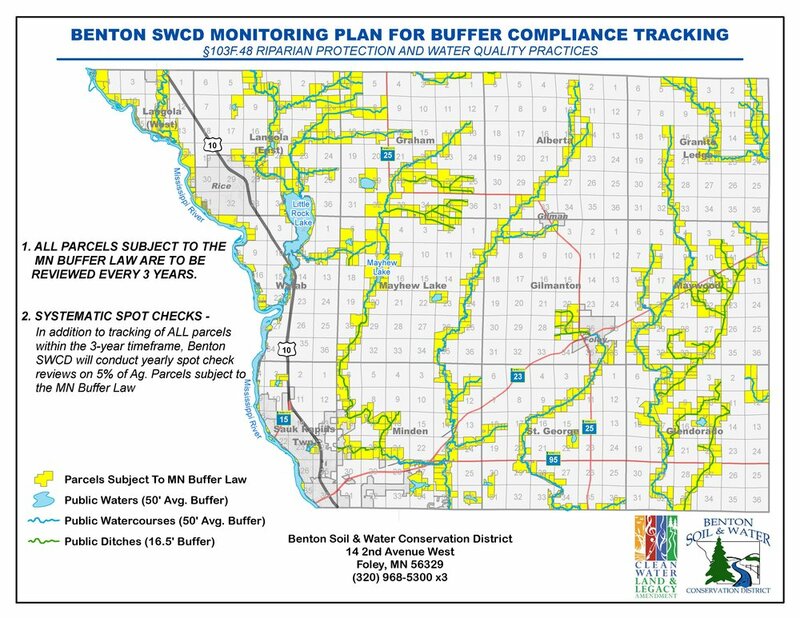 To establish the required buffer on your own, contact your local SWCD office. Local SWCD technicians can come out, and mark/flag the area that maybe out of compliance. The new law and existing ordinance requires that the 50 ft. buffer along public waters must be maintained in permanent perennial vegetation. The buffer can be planted to native prairie grasses, cool season grasses, pasture mixes, and/or trees. These areas can be grazed/hayed.